Fresh off the heels of a little movie called Captain America: Civil War, Marvel has launched a new Civil War, a thematic sequel to the original 2006 blockbuster. It might have slipped peoples’ minds, what with the attention being paid to DC’s rolling quasi-relaunch Rebirth, or even the publicity firestorm that erupted when Marvel decided to troll its own audience with recent revelations regarding Captain America’s terrorist inclinations. Civil War II arrives to little demand and much indifference, and so far has done little to justify its existence. Civil War II enters in a muddle, a sequel summoned into existence by the proximity of a movie. It’s difficult to see the germ of inspiration in this story besides a desire to pull a number of disparate threads across the Marvel Universe in the hopes of conjuring an interesting spectacle out of the resultant hodgepodge, on time and under budget. What arrives is less a story and more a pitch in search of a hook. It reads like a rush job, and if it isn’t, more’s the pity. David Marquez has done good work in the past, but this underdrawn issue is little aided by Justin Posner’s decision to color the book in various shades of port wine. Brian Michael Bendis struggles mightily to maintain the Civil War tradition of poorly conceived ideological struggles between marquee characters. 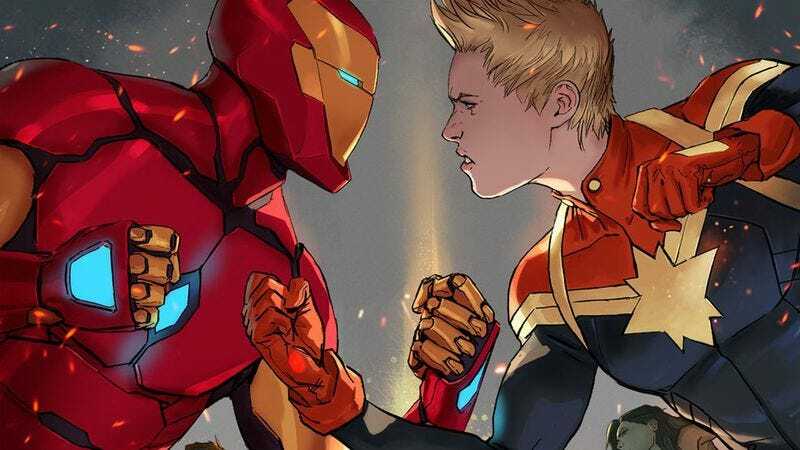 Instead of Cap, in this instance Iron Man battles Captain Marvel, as they split over the morality of using a new precognitive Inhuman named Ulysses as a tool in the fight against evil. Both sides have a stake in the conflict following the “shocking” death of Marvel mainstay James Rhodes, a.k.a. War Machine, a.k.a. Don Cheadle. Rhodey was Tony Stark’s best friend and Carol Danvers’ boyfriend (a relationship that hadn’t actually been mentioned in months before the word came down that the event needed a body count). The conflict this issue arises after Rhodes’ death, when Tony Stark decides to kidnap Ulysses in order to… well, that’s a bit hazy, honestly. People are going to fight about something. Marvel is to be praised for building its major summer event around the Inhumans, a concept that doggedly refuses to arrive with the stubbornness of Godot. Usually businesses try not to double down on failure, but Marvel’s commitment to selling the Inhumans is a bond that cannot be felled by God or man. Arcus: Chapter 0 (self-published) is exactly the kind of book readers should hope to chance upon in the sea of indie comics being made right now, and a big part of that is the cover. A lot of books, including offerings from larger publishers, do not pay enough attention to cover art, but Arcus features a wrap-around cover that just barely teases the major plot point for this first issue of about 30 pages. The art is beautiful, but the attention to composition and storytelling set it apart. Comics provide publishers with an opportunity to tell a story differently than it would be with prose, and too many people forget that the cover can be an integral part of that story, treating it the same as they would a novel. Artist Chan Chau delivers work that’s just as well thought-out in the interior pages as she does on the cover. The story focuses on Ingrid and Dom, who are traveling together even though they seem to barely tolerate one another. It has elements of the best kind of road trip stories, like E.K. Weaver’s The Less Than Epic Adventures Of TJ And Amal, but instead of shoving the duo into a car, they’re sailing in a boat that floats just high enough to snag the clouds. Chau and writer Erik Munson manage to create a fully formed, fascinating world in this single short issue, a tricky feat even for far more experienced creators. The premise feels like something from a Miyazaki film, and Chau’s sweet and pleasant way of drawing the characters suits that perfectly. The visuals are soft and beautiful, but the story is given room to be realistically grim in the face of misfortune, another hallmark of Studio Ghibli. Arcus finds a balance between aesthetics and good storytelling, while displaying a sweet and goofy sense of humor, mostly with Dom’s expressions and Ingrid’s pet ducks. The colors are muted but crisp, lending a sense of reality to a clearly unrealistic premise as Ingrid and Dom have to use anchors and sand ballasts to navigate their ship through a storm. There’s mystery and tension in the pages, questions about why food is in such short supply and why Ingrid is so bent on avoiding attention from the authorities, particularly when it appears Dom was once part of the nebulous “authorities” at one point. The beginning of a multi-part serial of heretofore unknown length, Highwayman: Episode One (Motherboard) by Koren Shadmi is a rigidly constructed and ominous webcomic. Composed of modular pages arranged on a six-panel grid, Shadmi’s images flow neatly and deliberately, pausing and pulsing with a strange rhythm. Like a polysyndetic sentence, it flows with a ceaseless vigor. But moments feel slower, calmer, they resist the established flow. It feels odd, off, and, in some ways, it is compelling. It other ways, it’s repellant. The Brooklyn-based cartoonist devotes much of this first installment to two characters talking, but that conversation, at times, turns from telegraphic and staccato to the loquacious flow of John Goodman in a Coen brothers film. This rhythm is largely the result of the friction between the two characters—both unnamed. The first, the titular Highwayman, is long-faced, and there is something amiss with his right eye. Matching his flat, monotonous delivery, Shadmi never adjusts this first man’s facial expression, and the reader is unable to firmly grasp anything about him. The reverse of this is the opposing man, the man of god who offers the first character a ride. This man is a Bible salesman, and Shadmi is careful to frame him so that he resembles an iconic Pilgrim. His tenor is hellfire and brimstone, and his expressions are rendered with precision. He resembles the odious religiosity and paternalistic furor of Reverend Henry Powell. Episode one of Highwayman ends with the hitchhiking Highwayman restored to life by some otherworldly orb, but strangely, that is not the most interesting bit of this story. The Bible salesman is. Drenched in a morose shade of blue, the Bible salesman takes on the role of hypocritical Christian—wrathful, greedy, petulant, impatient, and absolutely unobliging to anyone Other. With this man, Shadmi goads those who use their religion as some sort of inoculation against accusations of bigotry. Unfortunately, Shadmi is shackled by the space he’s been provided—or possibly the space he’s assumed for himself—and he shortcuts the motivations of this murderous zealot. Instead of teasing out these creepy and all-too familiar character, Shadmi has him unravel in an instant—totally squandering a character who, up until then, had been quite compelling. He creepily teases out information about his foe, but then he suddenly leaps to demanding the Highwayman’s bag, and he makes weird statements about the devil when he sees its contents. He accelerates from zero to 60 in an instant—and for seemingly no reason. It’s possible this leap will be resolved or corrected in later installments of the serial, but its appearance here doesn’t engender faith in future installments. The world is a scary place right now. International relations are tense, violent acts of terror are common, and the threat of environmental collapse is getting closer and closer with each passing day. Five-year-old Yotsuba Koiwai is blissfully unaware of all this. The star of Kiyohiko Azuma’s Yotsuba&! manga series is still discovering the small stuff in life, and each chapter of Yotsuba’s story highlights a different thing that triggers a strong emotional reaction in her young, easily excited mind. In the new Yotsuba&! Vol. 13 (Yen Press), Yotsuba takes pleasure in giving and receiving souvenirs, gets scared during a solo late-night walk through her house, and goes totally ballistic when her grandma visits. The stakes of these events are extremely low compared to most other narratives, but Azuma makes the stakes overwhelmingly high for Yotsuba, who puts her full spirit into everything she does. Her imagination is constantly in overdrive, and she goes through erratic mood swings that make it difficult to know what she’ll do in any given situation. That unpredictability is a big part of why Yotsuba is such a fun protagonist, and it makes her seem even more like a real kid. Children are random; they react on instinct and say the first thing that pops into their heads, and there’s not much logic behind their thinking because they haven’t developed it yet. Yotsuba finds joy and beauty in the things that most adults take for granted, and Azuma uses Yotsuba’s astonishment with ordinary people, places, and objects to create much of the book’s humor. That childlike wonder is contagious, and the grown-ups around Yotsuba are often swept up in her flights of fancy because she gives them the chance to act like a kid again. Azuma’s immense skill as a cartoonist invites the reader to get swept up too, and while Yotsuba&! is a great book for young readers, it’s an especially attractive title for adults looking for something on the light and silly side, but still retaining a level of sophistication in the craft. Azuma is an impeccable draftsman, and the detail he brings to his environments immerses the reader in Yotsuba’s world. The main setting of Yotsuba’s house has been thoroughly defined over the course of 13 volumes, creating a strong sense of invasion when Yotsuba’s grandma shows up and starts changing things.